On the exquisite sandy beach of Fodele lies the homely yet elegant Fodele Beach & Water Park Holiday Resort. The beachfront hotel is blessed with breath-taking views and surroundings and is among the most popular holiday stay options in Crete, Greece. Built in the Renaissance style, the accommodation units, built in the form of bungalows, are dotted amid gardens of unparalleled beauty. These inviting rooms are laced with en-suite bathrooms, direct dial telephone, mini bar, individual air conditioning and a safety deposit box. The accommodations also feature private balconies and sunny terraces and enjoy picturesque views of the ocean from their windows. Various amenities like full body massage and sauna, lounges and sunny terraces by the pool are among the main features of the resort. The hotel has a spacious foyer with a café, a bar, a TV room, a smoking room, and an à la carte restaurant. To add to the list, there is a conference room, a public internet terminal and a currency exchange desk. For guests aged between 4 to 12 years, the hotel has a playground and a kid’s area. Another highlight of the hotel is a fun-filled waterpark within the premises that features a variety of water siles and other fun games. Located by the idyllic Fodele Beach, the resort is blessed with mesmerising views that ensure a cherishing a stay for its guests. 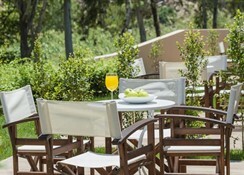 Heraklion Port and Heraklion Public Garden are approximately 19 km from the resort. EL Greco Museum is the most popular landmark that gathers tourist attention from all across the globe. 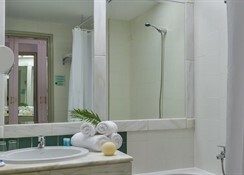 The hotel is just 25 km west of Heraklion international airport in Crete. A total of 412 air-conditioned rooms, built in Mediterranean style and featuring contemporary decor, are on offer for guests at Fodele Beach & Water Park Holiday Resort. Elegant double rooms, sun rooms, superior rooms, sunset rooms, signature collection rooms (cokes with distinct decor), superior family rooms, maisonettes and luxurious family suites are the various categories of accommodation at the hotel. The rooms are equipped with direct dial telephone, satellite TV, minibar and air conditioning. Fodele Beach Hotel offers a diverse range of cuisines including Greek, Italian and French. Apart from the main restaurant that offers buffet breakfast, lunch and dinner, the hotel has 3 more restaurants namely Ambrosia, Elia and an all-day restaurant. The main restaurant also organises theme nights featuring Spanish, Mexican and Oriental dishes. Ambrosia is an a la carte restaurant with relaxed yet sophisticated Greek dining. Starlight Bar and Starfish Beach Bar, in addition to the main bar, together serve a great range of drinks and beverages. The beach resort facilitates a long list of indoor and outdoor activities. Besides several games and sports facilities, visitors can rejuvenate themselves with a full body massage and sauna at the hotel spa or work out in the fitness centre. All the 3 swimming pools offer sea views, while the sunny Fodele beach is the perfect place for beach bums. The hotel also provides beach towels on request. For younger guests, there’s a waterpark and kid’s club. the waterpark offers a number of water slides as well as a snack bar for hunger pangs. Table tennis, lawn tennis, mini golf course, darts, billiards, snorkelling and diving are some of the sports facilities at the Fodele Beach & Waterpark Holiday Resort.